The General Directorate of Cultural Heritage and Museums under Turkey's Culture and Tourism Ministry gave consent to organize annual Orthodox rituals after they had been banned for 88 years in Aug. 15, 2010. This year's event is taking place on the same day marking the ascension of Virgin Mary into heaven. Maçka District Mayor Koray Koçhan said the municipality completed preparations in collaboration with the Trabzon Metropolitan Municipality. "Regional officials took necessary precautions against possible security, accommodation, transportation and health problems," Koçak said to Anadolu Agency. All municipal institutions have made efforts to host the organization in a peaceful and safe atmosphere. "[Participants] can perform their prayers without any risk, as has been seen in the previous years. We are expecting between 300 to 400 Orthodox visitors. There is nothing extraordinary. We took usual security measures," he continued. "Municipal officials will welcome them with better hospitality. I wish them a peaceful ritual and a safe trip back home," Koçhan concluded. Dedicated to the Virgin Mary, the Orthodox monastery is surrounded by a dense forest that is 300 meters above the Altındere Valley. In the 18th century, a large part of the building was renovated and some of its walls were decorated with frescos. A century later, the monastery was renovated again giving it an impressive appearance with the addition of new sections. It has been extremely important throughout history and attracted scores of tourists and wanderers who mentioned the monastery in their journals. It was granted a special protected status by Sultan Mehmed II and was renewed by following sultans. The main sections of the monastery complex include a library, kitchen, student rooms, several chapels, a guest house, a holy spring and the rock church. 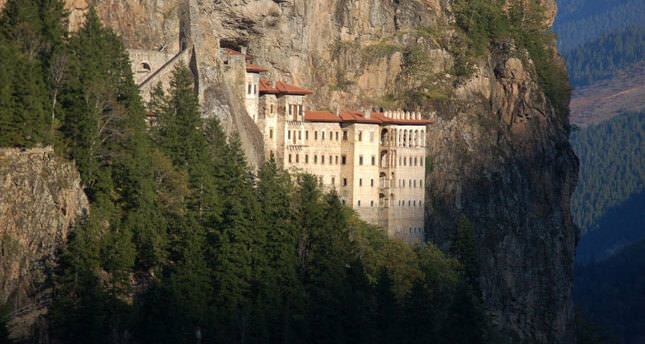 The Sümela Monastery was built over a large area with an aqueduct built against the cliff at the entrance that provided water to the buildings. The entrance with its guardrooms leads to a long stairway and another stairway leads to the inner courtyard, on the left of which, in front of a cave, are several more monastery buildings. The cave, which was converted into a church, is the center of the monastery. The library is on the right side and the large building with a balcony on the front part of the cliff was allocated for monks and guests. The frescoes of the chapel date back to the 18th century and were painted on three levels in different periods. The frescoes at the bottom look better than others and a significant part of them were ripped off and damaged. The images on the frescos feature biblical scenes about Jesus and the Virgin Mary.